The Palaeolithic lasted for hundreds of thousands of years in Britain. During this time the climate alternated between a series of glacial (cold) and inter-glacial (warm) phases. Archaeology has divided the Palaeolithic into three periods based on changes in flintworking technology - these are called the Lower (oldest), Middle and Upper Palaeolithic. The first residents of the area that would become the Isle of Thanet would likely have entered during one of the warm inter-glacial phases of the Lower Palaeolithic. Between these phases, ice sheets advanced across much of the country and gave Thanet a tundra landscape which drove people and animals further south seeking a warmer climate. Seasonal hunting of migrating herds may occasionally have brought people through the area during colder times. The rise and fall of sea levels associated with the changes in climate may well have altered the patterns of access to Thanet. High sea levels during inter-glacial maximums may potentially have left Thanet an island and thus inaccessable for long periods during the warmest phases. This may be one reason for the apparent rarity of evidence for Palaeolithic activity on Thanet. Similar chalk upland areas of mainland East Kent between Deal and Dover have proved to be much more productive. It appears that all the Palaeolithic people lived a mobile lifestyle of hunting and gathering. How long they stayed in any one place would be dependant on the availability and quality of the local resources. The need for fresh drinking water would have led to much of our ancestor's activities being centred around river valleys. This would also have been a good location for ambushing game who congregated in these places to drink. River deposits often provide the best (though usually redeposited) evidence of Lower Palaeolithic activity. 19th Century quarrying of the gravel terraces of the ancient river Stour around Fordwich uncovered hundreds of handaxes. Many have also been recovered on the beach in the area of Bishopstone Glen (between Reculver and Herne Bay), having eroded from the deposits of an old water-course exposed in the cliff. It is likely that Lower Palaeolithic camp-sites were simple affairs, with few if any rigid structures (ie. shelters) that have left an archaeological record of their existence. As humans developed we begin to find evidence for more structured (though still largely temporary) settlements and see the changes and advances in the quality of the material culture they left behind. How much our distant ancestors relied on actual hunting activities remains a matter of debate. Some food could certainly have been obtained through opportunistic scavenging. Evidence for hunting has been found in Britain and Europe however through the fortunate preservation of wooden spears. The end of one spear was discovered at Clacton and dated to circa 400,000 BC. Evidence from the Palaeolithic period is rare in Thanet and each artefact recovered makes a vital contribution to an evolving story. Only eight flint tools, all handaxes from the Lower Palaeolithic, have been certainly identified so far. 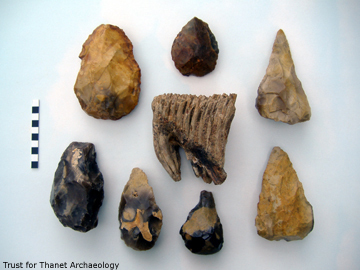 The handaxe is the archetypal flint tool of the Lower Palaeolithic. Useful for a multitude of butchery tasks, it has been likened to a modern-day 'Swiss Army knife'. 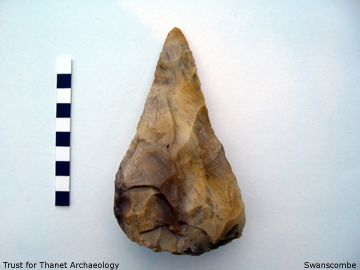 Most of Thanet's Palaeolithic handaxes have been moved from the places where they were originally discarded. Only one or two have been discovered in virtually their original context (or as close as we are going to get). Relatively undisturbed artefacts are most likely to be found here in the geological deposit known as 'clay-with-flints’ which occurs sporadically above the chalk. They are also often found on surviving patches of old river terraces. Human remains of the period are incredibly rare and none have been found in Thanet. It is said that Britain's entire collection of Lower Palaeolithic human bone could probably fit into a shoe-box! No Middle Palaeolithic artefacts are known to have been found here. There are only two possible flints from the Upper Palaeolithic period (unconfirmed at present). The Palaeolithic inhabitants represented by these Lower Palaeolithic handaxes are likely to be Homo Sapiens Heidelbergensis and they are not our direct ancestors. Heidelbergensis was the ancestor of the Neanderthals - Homo Sapiens Neanderthalensis, who occupied the Middle Palaeolithic period. No ancient remains of the latter are known to have been found on Thanet so far. Our modern ancestors are Homo Sapiens Sapiens who derived from the African side of the Heidelbergensis family. They arrived in Western Europe around 40,000 BC, having migrated out of Africa thousands of years before. Their appearance heralded the Upper Palaeolithic period. It saw great advances in tool-making and they left us evidence demonstrating a rich and diverse cultural life. The search is on for evidence of Modern Man in Thanet.